Directed by Hoku Uchiyama. USA. 2013. 60 mins. This inspiration documentary takes us behind the scenes to watch the birth and journey of India Jazz Suites, a phenomenal East-meets-West collaboration featuring Indian kathak master and guru Pandit Chitresh Das and tap star Jason Samuels Smith. Das is a 68-year old artist who exemplifies the elegance and mathematical precision of kathak, the classical dance of North India. Jason is a 28-year-old African-American who hails from the freestyle, streetwise American tradition of contemporary tap. As the two join forces, an unlikely friendship develops that bridges continents, generations, cultures and communities. Shot backstage and on the pulsating streets of India, New York, Los Angeles and San Francisco, Upaj: Improvise captures the exhilaration and magic of the India Jazz Suites tour and offers a kaleidoscopic view of Indian history, culture and tradition. The pair’s journey together offers a message that resonates deep in every heart and soul. 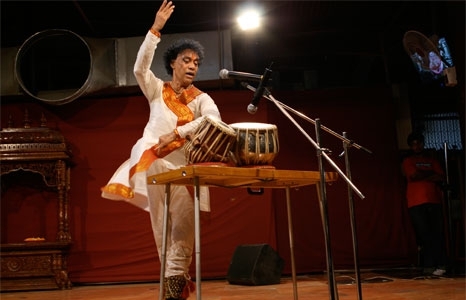 Special performance, Jan 16 at 7pm: Antara Bhardwaj, the producer of Upaj: Improvise, is also an accomplished Kathak dancer and a disciple of Pandit Chitresh Das. Presented in collaboration with Shangri La The Doris Duke Foundation for Islamic Art. Antara Bhardwaj will rejoin the audience after the screening for a Q&A session. Juggling two full-time careers, Antara is a filmmaker and a Kathak dancer, trained since childhood under Pandit Chitresh Das. After completing her film studies at the New York Film academy, she worked as an assistant director for acclaimed director Jagmohan Mundhra on films such as Provoked (Aishwarya Rai, Naveen Andrews). At the age of 25, she went on to direct her own feature film, the British thriller Telling Lies, starring Spice Girl Melanie Brown and Jason Flemyng (Curious Case of Benjamin Button). Upaj is her first documentary. As a Kathak dancer and teacher, Antara tours extensively, and has performed all over the U.S. and India.